Entering the re-conditioned automobile market, SML Frontier Automotive, the sole agents of Jaguar Land Rover (JLR) in Sri Lanka, on Thursday launched the new certified pre-owned program, branded as ‘Approved’, to develop and grow its customer base by offering an unprecedented level of service to pre-owned clients. Outlining the key features of the ‘Approved’ program, JLR Asia Pacific Importers Pre-Owned Manager Garth Turnbull said the launch signifies a shift in the approach to selling pre-owned vehicles in Sri Lanka. “Immediately, our customers will benefit not only from complete peace of mind, but also the quality and standard of service they would expect from JLR when selecting a pre-owned vehicle. It has been developed by a multi-functional JLR team, benchmarking alternate programs to create an industry-leading program that I am certain will meet and exceed our local customers’ expectations,” he stressed. Further, he pointed out that every ‘Approved’ pre-owned Jaguar or Land Rover vehicle is independently inspected by a specially trained team to ensure that high standards of vehicle preparation and customer service are met and maintained. “Customer trust and confidence are the cornerstones of our business. All vehicles part of the program are inspected meticulously. The seven key elements, including two-year warranty, 24-month road assistance, 165 multi-point inspection, reconditioning by trained technicians, genuine parts, history and provenance checks, and road test assessments, are conducted to ensure that pre-owned vehicles are in the best condition in both power and engine, including the perfect vehicle body with the use of technology and the latest inspection tools and devices,” Turnbull explained. Commenting on the launch, SML Frontier Automotive CEO Ravi Perera said there is a good potential market in Sri Lanka for the ‘Approved’ program. “We are pleased to launch the ‘Approved’ program in Sri Lanka. This opens new doors for us and will give our customers the ultimate retail experience in line with buying a brand new vehicle, removing any concerns of future ownership through superior vehicle preparation and the provision of class-leading warranty and roadside assistance,” he stated. 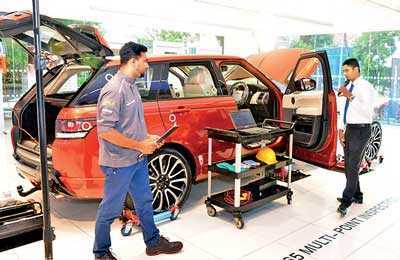 Elaborating on how the market operates in Sri Lanka, SML Frontier Automotive Approved Pre-Owned Manager Chandima Gooneratne said the Land Rover used vehicle market has always experienced a very high demand, and that the ‘Approved’ program will attract a great number of new customers as well. “We have been doing the trade in vehicles for years, but we didn’t have all these warrantees that come under the ‘Approved’ program. The new ‘Approved’ program now gives us an opportunity to develop and grow our customer base and their loyalty by offering an unprecedented level of service to pre-owned customers, encouraging them to return and buy another pre-owned or even new vehicle,” he added. For more information on the ‘Approved’ program in Sri Lanka, visit www.approved.lk.jaguar.com and www.approved.lk.landrover.com, or visit the Jaguar Land Rover showroom at No. 74, Flower Road, Colombo 7.